Personalized Angels Sweatshirt for Mom, Nana or Grandma. 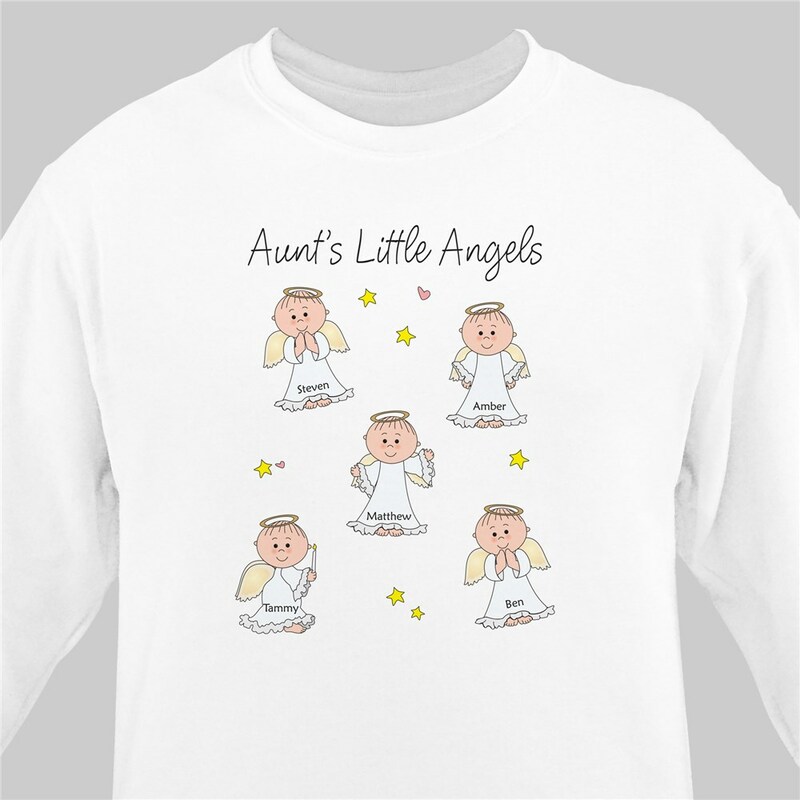 Show off your kids or grandkids with our angels Personalized Grandma Shirts designed for Nana, Mom and even Auntie. A thoughtful gift sure to warm the hearts of all who wear this perfect Personalized Gift. Your new Personalized Sweatshirt for Mom or Grandma is available on our premium cotton/poly blend Sweatshirt, machine washable in adult sizes S-3XL. Sweatshirt for mom or grandma includes free personalization of any title like, Mom, Grandma, Nana, Great Grandma, Gram, Granny, Nonna, Abulea or Babcia you choose or create your own and up to 30 childrens names. Shirt is printed with your title's Little Angels and each name has it's own angel. Absolutely adorable! Ordered this sweatshirt for our special Grandma, and can't wait to see her face when she opens this present. Just as pictured and shipment was delivered within a few days. We know this will be her favorite sweatshirt ever!! This is the second sweatshirt I have recently purchased from your company. The first one was for Halloween and now this one and I LOVE them both!! My only suggestion is that you have other colored sweatshirts available to order other than just the white. Looking for the perfect Mother’s Day Apparel for Mom or Grandma? We have Mothers Day apparel, Mom Apparel, Grandmother apparel, Grandma apparel, even Granny apparel, and apparel for Moms, apparel for Grandmothers, apparel for Mothers and apparel for Grandmothers. Choose from our Mother’s Day Apparel today. GiftsForYouNow.com is your home for great Personalized Valentines Day Gift Ideas. We offer all kinds of great gifts for Valentines, and our Top Ten Valentines Gifts even include a Valentines gift basket, and some affordable Valentines Day gifts, too! Choose www.GiftsForYouNow.com for all of your Valentines Gifts. Valentine's Day gifts also make unique Sweetest Day Gift Ideas.